Will and I walked into the banquet room of the sushi restaurant and glanced around. Family style eating made both of us nervous. In general, we are not really communal, sitting with strangers kind of folk. Did we risk it, sit at an open table and hope someone sane sat next to us? Or did we take control and strategically place ourselves next to a "normal" looking group? We decided on the latter. "How about over there?" I said, pointing to a table at the far end of the room where another couple was already seated. We took our seats and introduced ourselves to Daniel and Briana. Shortly into the meal, I realized this couple was different. I felt strangely comfortable with them, almost like reconnecting with old friends. Briana mentioned that she and Daniel were engaged and we started talking about the proposal, the dress, and all things wedding. We shared stories of our little boys and heard about their jobs and schooling. We learned that they were attending and actively involved in a church downtown and we discussed our faith. By the end of dinner, I felt like I had known them forever. During a quick moment alone, Will and I agreed that we really liked Daniel and Briana. They reminded us so much of ourselves when we were first married. We didn't really want to end the night with a "It was nice to meet you" and head back to our separate lives. As I usually do in this sort of social situation, I pressed Will to say something. When he said, "Would it be weird to get together again?," Daniel responded that he had just been thinking the same thing. So, we exchanged cell phone numbers, said goodnight and walked to our cars. Once inside the truck, Will said, "I hope we actually do see them again." So unlike him to go out and unexpectedly make friends. So unlike both of us. Within a couple of weeks, we invited them over for dinner at our house - sushi takeout with the kiddos and pumpkin brownies for dessert on the back patio. My oldest, Wilson, can be a tough guy to win over, but he loved Miss Briana and Mr. Daniel. As I put him to bed that night, he even asked if they could come over and play again. We had a wonderful evening playing Mexican Train and talking about everything from wedding planning to their affinity for Dungeons and Dragons to Will's growing (literally) interest in beards. We even shared a laugh when Briana admitted they had been a little nervous coming over and had given our address to a friend "just in case." Over the next few months, we exchanged text messages, met downtown for Ethiopian food and became Facebook friends. I even enjoyed a rare girls' night out with Briana. I really was growing fond of her. In some bizarre way I was feeling both friendly and maternal toward her. After all, her mother was only five years older than me. And I saw a lot of myself in Briana. Then we got it - the wedding invitation! Will and I were so honored to attend their beautiful ceremony earlier this month. As we watched Daniel and Briana exchange vows, I so clearly remembered our own wedding ceremony. Watching them navigate this wonderful place in life gives me such déjà vu. Don't tell my husband I told you this, but he actually teared up! Now, I am the crier in our family. I can shed a tear over just about anything. But, Will does not cry. As I watched them share their first dance with each other and then with their parents, I was overcome with emotion. First, because their love for one another is so evident, you can actually feel it. Then because I was reminded of my own dad as we danced at my wedding seven years ago and my heart ached at missing him. And, finally, because I saw my future when I watched Daniel dance with his mother. I could so clearly envision dancing proudly with my own sons when they are grown and starting their own lives with the women they choose to marry. It is a very strange thing to simultaneously relate to someone as your past and future self. And a great blessing, I think. Daniel and Briana are on the cusp of a wonderful new life together. I hope their marriage is long and sweet. 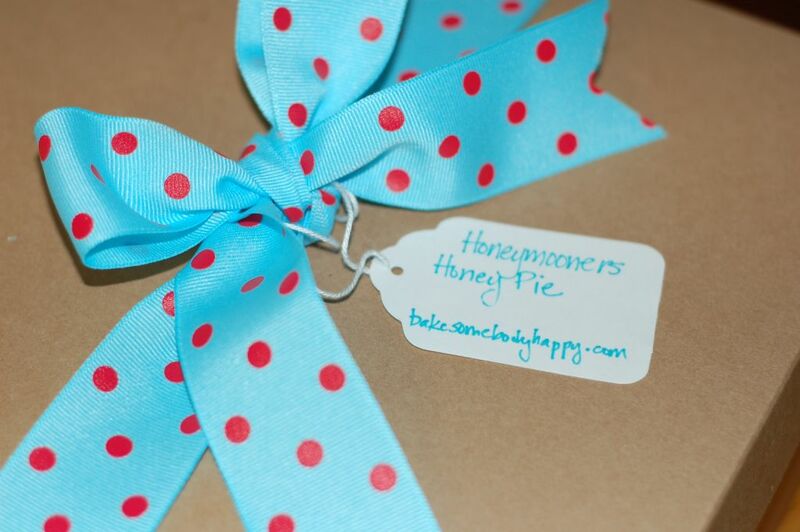 How about celebrating with a slice of Honeymooners' Honey Pie? Following last week's graham cracker crust, I had been hankering to get my hands into some good old-fashioned pie dough. But, I had some crust difficulties this time. Mostly because I was overzealous and jumped the gun instead of waiting the recommended hour rest time in the fridge. And partially because I am just way too hard on myself. I mean, who cries over pie crust? Um, me. (I told you I could cry about anything.) So, I fought the crust a little more than usual. I am not completely happy with the aesthetics of my crust fluting this time. 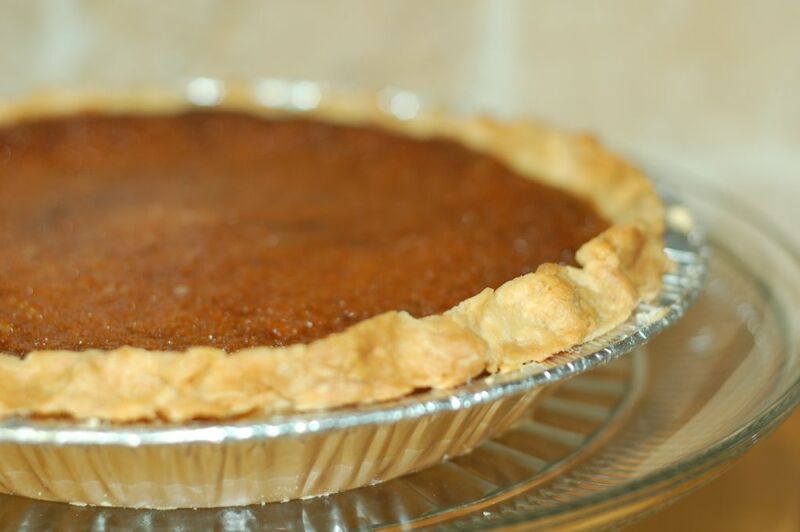 But, pie making has been a lesson in accepting "ok" instead of demanding perfection. I think this probably translates to life outside of the kitchen as well. Anyway, back to the honey pie. (I just love saying that. It makes me smile.) This was my first experience with blind baking a crust. That should partially explain why I was so unprepared and had neither pie weights nor dried beans handy. Thankfully, my ultra-practical husband quickly calmed my panic with a trip to the backyard and a quick rinse of some gravel. The pea gravel worked beautifully placed into the parchment lined crust. But that reminds me, I need to put pie weights on the grocery list. 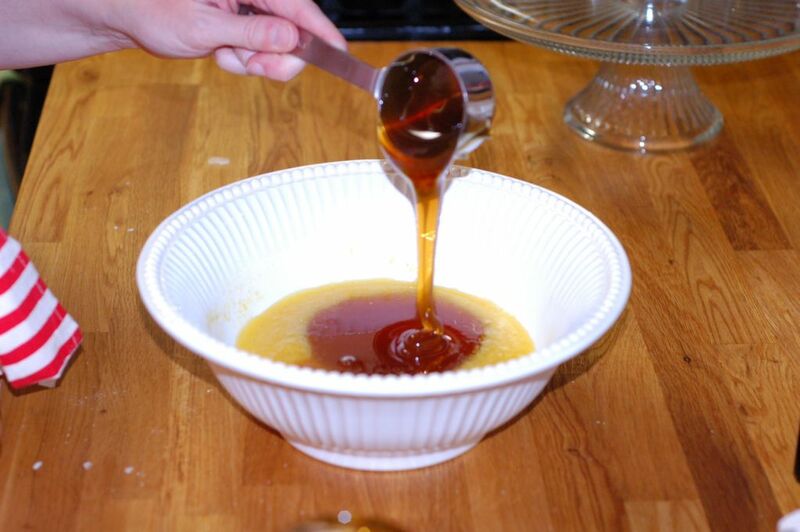 While the crust was in the oven, I prepared the ingredients for the honey custard. I was slightly concerned about the possible texture issues that the cornmeal might pose, but went ahead anyway. Then I stirred the melted butter, vanilla and honey into the dry ingredients. I absolutely love honey. I am giddy when it drips over the side of the jar and requires me to swipe it up and lick it off my finger to avoid a sticky disaster. It makes me feel like I'm getting away with something. Then for the basic ingredients of any good custard - heavy cream and eggs. 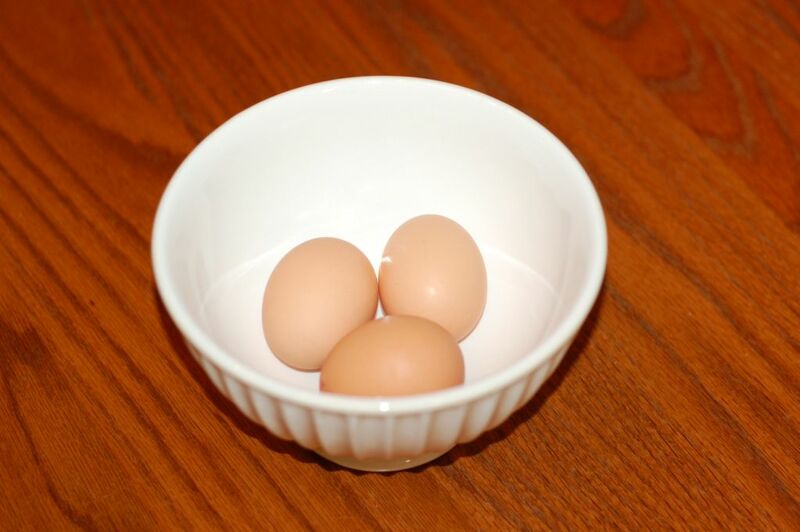 I bought lovely little organic brown eggs at the store this time, but I am so excited to be getting our own chickens this spring! Having a coop right in my very own backyard just seems so homespun. And probably means lots of custard pies. I poured the custard into the pre-baked crust and put it into the oven. 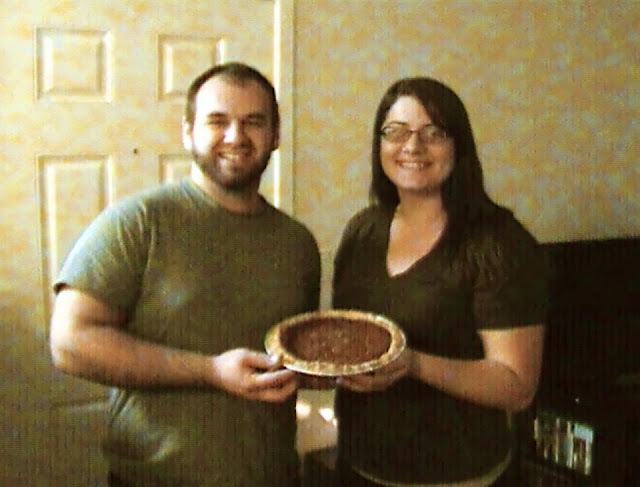 45 minutes later, I had myself a beautiful toffee colored pie. Well, at least the filling was pretty. And it smelled heavenly. 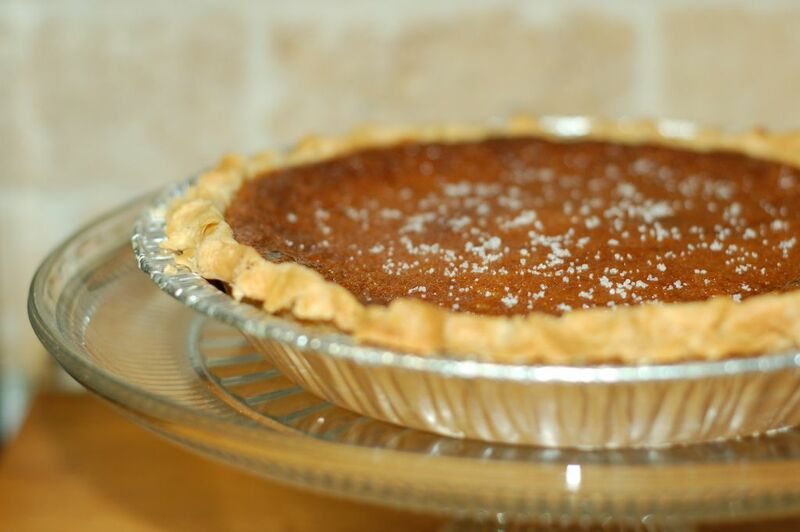 When the pie was completely cooled, I sprinkled the top with sea salt. I am completely obsessed with the whole savory dessert thing lately. It's a match made in heaven. Salted caramels, chocolate covered bacon...Ooh, that gets me thinking...Bacon pie anyone? As Will and I have said so many times about our meeting Daniel and Briana, "It was a God thing." There clearly is something bigger than us at work here. God brought them into our lives for, I am certain, a very specific and probably still to be determined reason. The beginning of every relationship, whether marriage or friendship, has a honeymoon phase. There is so much to be said of an old friend, but there is also something wonderful about a new friend, when you know the memories are still in the making and the best times lie ahead. I can't wait to see how it plays out. Lol, this honey pie is going to make the honeymoon so memorable I must say. I will have them too in my honeymoon time, thanks for the share.